Restoration of active finger grasp. Surgical tendon transfers involve the careful assessment of lost motor function, or more often, a combination of lost functions. The assessments themselves are quite challenging. They include intriguing functional measurements and very often true control comparisons are not possible as the neuromuscular injury or disease itself is bilateral. The surgeries themselves are also technically challenging, as there are many complicated real-time decisions to be made. 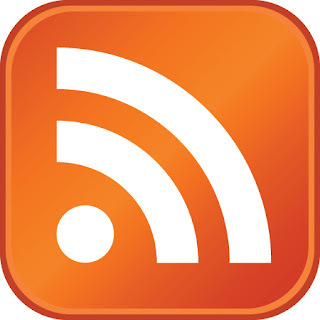 During surgery there are several technical details that need to be addressed. For example, selection of donor muscles, routing of donor muscles, tissue preparation and optimization, tensioning of muscle-tendon units, balancing joints and suturing attachments. Postoperatively, the surgeon needs to be directly involved in the rehabilitation as well as carefully instructing occupational therapists and physiotherapists in postoperative patient care. It is, after all, only the responsible surgeon who knows the details of the surgical procedure performed. This is where experience becomes so important. We are all aware of the fact that there are no shortcuts in our endeavor for perfection in the highly demanding and exquisite field of reconstructive hand surgery. 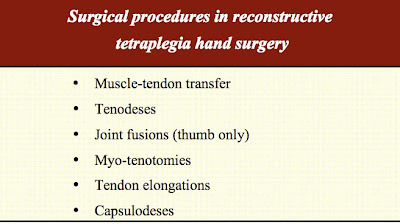 Development of new surgical techniques and refinement of postoperative rehabilitation has greatly enhanced the outcome of reconstructive tetraplegia hand surgery lately. Table lists procedures that alone or combined are used to reconstruct various functions needed to improve the tetraplegic individual’s motor ability. It was early recognized that the wrist is the key joint of the tetraplegic hand and the creation of a pinch between the tip of the thumb and tips of the index and middle finger was suggested. For tetraplegics functioning at C6-C7 level with ability of actively extending the wrist, tenodesis of finger and thumb flexor tendons to the radius was recommended. For C7-C8 functioning level, multiple muscle-tendon transfers were suggested. The general trend is to direct the treatment towards the restoring abilities more than just functions. In other words, the communication with the patient and her/his caregivers and relatives is critical in order to pinpoint the exact needs of improvement in daily life activities. It is not the functional improvement from the surgeon’s or the therapist’s perspective that is important but demands from the patient to be able to control as many as possible of the daily routines of life. Not until this attitude has been fully implemented into the preoperative assessment and goal discussion, we can truly provide the service requested. Based on the experience from more than 700 reconstructions performed in the Swedish National Center for Reconstructive Hand Surgery in Tetraplegia, we prefer to primarily reconstruct grip function before reconstructions of the thumb and finger extensors. In our experience some individuals decide to only undergo one reconstruction and are happy with that. If they would choose to quit after one reconstruction, any further reconstructions after just having the extensor function restored would not benefit them functionally so much. On the other hand, if they settle after a grip reconstruction they have gained a lot of new abilities of daily life. It should also be kept in mind that we regularly reconstruct the intrinsics in the same operation as the reconstruction of grip, thus providing a fair opening of the hand. Recent development in our unit combining reconstruction of thumb and finger flexion with reconstruction of interossei has dramatically reduced the need for subsequent reconstruction of extrinsic extensors. Before performing surgical rehabilitation of the upper limb, care must be taken to preserve the integrity and health of the upper limbs in the acute injury period. The principal therapy includes: preventing and treating hand edema, maintaining supple joints and controlling pain and spasticity. Preoperative evaluation of the upper limb includes muscle strength tests, joint range of motion tests, and sensation testing. View more documents from Jan Fridén. Muscle testing is performed according to the British Research Council system (see above) and the assessment of tetraplegia function groups that was modified at the 6th International Tetraplegia Meeting 1998, Cleveland Ohio. 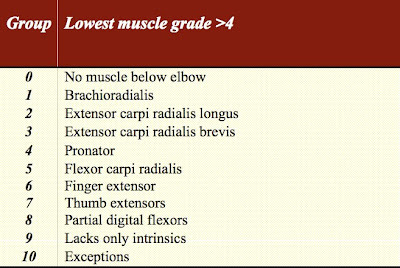 The donor muscle must be of adequate strength (usually strength grade 4 or 5, see below) and preferably not injured or re-innervated. In certain conditions, with limited available donor muscles, a weak muscle can be considered for transfer. When several donor muscles are available for transfer, additional factors are considered. 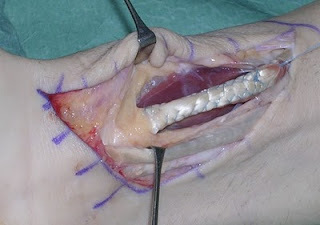 These include the condition of soft tissue in which a transfer must cross, route and direction or the transfers, donor site morbidity, the architecture of the donor muscle and function desired, synergism of the tendon transfer, the experience and preference of the surgeon, and the consensus or preferences of an informed patient. Optimally, the donor muscle must be healthy, synergistic, similar in architecture, and have an adequate soft tissue bed along the route of transfer. The basic procedures for reconstruction in tetraplegia include reconstruction of elbow extension, of grip function and opening of the hand. Restoring active elbow extension for the spinal cord injury patient in terms of locomotion, transfers and accurately positioning the arm in space is critical and it improves the effect of more distal tendon transfers to restore hand function. The disability pattern in posttraumatic tetraplegia has shifted over the years. More incomplete tetraplegica with a somewhat new configuration of functional loss has been detected. These individuals demonstrate more complex functional loss, often with various degrees of spasticity. The general approach therefore needs to be an even more careful assessment of remaining useful functions but also to realize and utilize the possibilities of correcting stiffness, deformities and hypertonicity by more actively perform tendon lengthening and releases and to incorporate these lengthening procedures as natural parts of tendon transfers. The most remarkable and effective strategy of improving function has been the consistent and immediate activation of transferred muscle after surgery. Early active training of new motors not only prevents the formation of adhesions but facilitate the voluntary recruitment of motors powering new functions before swelling and immobilization-induced stiffness restrains muscle contractions. Additionally, the patient will experience an early, spectacular and inspiring effect of the reconstruction, which, will help motivate training during the demanding and sometimes painful initial postoperative period. Early activation of the transferred muscles requires reliable tendon-to-tendon attachments. We have cumulated experience of hundreds of site-to-side attachments using running sutures back and forth along both sides and with a minimum of 5 cm overlap (see figure). This technique has proven extremely safe for allowing early active training and is now standard in our unit. Briefly, the day after surgery a removable splint replaces the cast and intermittent exercises commence. Training emphasizes on activating the donor muscles without any external resistance. During nights and between training sessions the patient wears a splint with a design that aims at unloading the attachment sites. During exercises “training splints” are used. The exact design of the splints depends on the actual combinations of surgeries performed. Four weeks postoperatively active use of the grip in activities is started, using only a splint during nights. The load is then gradually increased up to three months postoperatively when the patient is allowed full active normal daily life including personal transfers. The general population inside the additional made countries other than having preparing, information and the and visit site subsequently the and besides the capacities they furthermore the development that a most pleasing component by that the benefits of a commonplace are regularly revamped into the most ideal way.